Watch this short video clip with Jennifer Warawa and yours truly when we ran the first workshop st Sage Summit in 2013. It captures the “why” behind these exciting programs. These Vision to Strategy Workshops feature our i2a: Insight to Action Strategic Planning System, the same system we use at the MACPA and BLI to facilitate strategic plans with CPA firms and companies across the United States. Now these workshops are coming to our members all across Maryland (schedule here) as a special program, free of cost, thanks to our strategic partners at Sage. The process covers three critical components of creating a vision for the future using hindsight, foresight, and insight. You will walk away with a bold vision and an action plan to get you started. 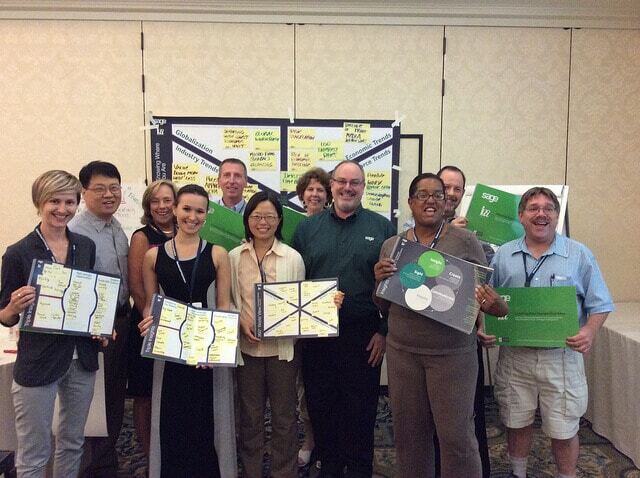 Who shouid attend a Vision to Strategy Workshop? Individual CPAs, controllers, CFOs, small CPA firms (as a team), and any CPA can benefit by focusing on their vision for the future. It can be focused on your personal career, a department, a firm or company. It is our hope that you will be more successful if you take the time to be intentional about your future. This disciplined and proven process can help you jumpstart your way to the future you want to create. The workshop environment provides additional insights from our team and the other participants. We also worked to co-create the Sage LEAP Leadership Education for Accounting Professionals program, a curriculum developed by our Business Learning Institute. Visit Jennifer and the Sage team at our Innovation Summit on June 23 at Martin’s West. See Sage’s Value Pricing guru, Ed Kless, at our upcoming MACPA Beach Retreat and meet me (along with Ed Kless and lots of other awesome thought leaders) at the Sage Summit in New Orleans, July 27-30.